I chose this aritifact because it’s a very old and preserved statue of ancient Egypt, the reason we did this is to understand what happened in ancient times, and see what they made in the older days and why they made it. The artefact was about 1345 B.C. and was created for the Pharoh’s Wife, who was very worshiped and special to the people of Egypt. 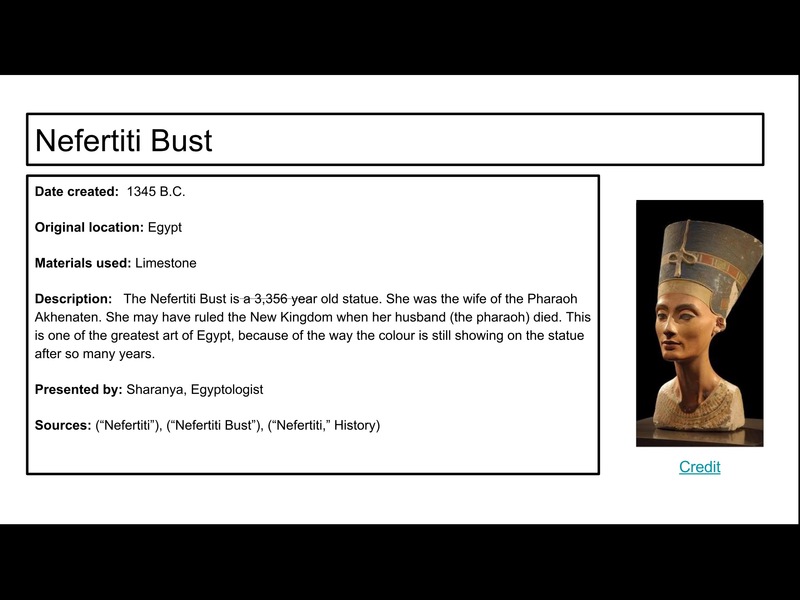 The project was to pick a aritifact from any of the four Civilizations we researched (Indus,Nile,Mesopotamia,Yellow) that we found interesting and make note cards from three different sources to make a small notecard which will be shown below, and make out speech for our video using that too. This entry was posted in Uncategorized by 23sdevgon. Bookmark the permalink.